The works of William Shakespeare and Beethoven, and most early silent films, are in the public domain either by virtue of their having been created before copyright existed, or by their copyright term having expired. Some works are not covered by copyright, and are therefore in the public domain—among them the formulae of Newtonian physics, cooking recipes, and all computer software created prior to 1974. Other works are actively dedicated by their authors to the public domain (see waiver); some examples include reference implementations of cryptographic algorithms, the image-processing software ImageJ, (created by the National Institutes of Health), and the CIA's World Factbook. The term public domain is not normally applied to situations where the creator of a work retains residual rights, in which case use of the work is referred to as "under license" or "with permission". As rights vary by country and jurisdiction, a work may be subject to rights in one country and be in the public domain in another. Some rights depend on registrations on a country-by-country basis, and the absence of registration in a particular country, if required, gives rise to public-domain status for a work in that country. The term public domain may also be interchangeably used with other imprecise or undefined terms such as the "public sphere" or "commons", including concepts such as the "commons of the mind", the "intellectual commons", and the "information commons". Although the term "domain" did not come into use until the mid-18th century, the concept "can be traced back to the ancient Roman Law, as a preset system included in the property right system." The Romans had a large proprietary rights system where they defined "many things that cannot be privately owned" as res nullius, res communes, res publicae and res universitatis. The term res nullius was defined as things not yet appropriated. The term res communes was defined as "things that could be commonly enjoyed by mankind, such as air, sunlight and ocean." The term res publicae referred to things that were shared by all citizens, and the term res universitatis meant things that were owned by the municipalities of Rome. When looking at it from a historical perspective, one could say the construction of the idea of "public domain" sprouted from the concepts of res communes, res publicae, and res universitatis in early Roman law. When the first early copyright law was first established in Britain with the Statute of Anne in 1710, public domain did not appear. However, similar concepts were developed by British and French jurists in the 18th century. Instead of "public domain", they used terms such as publici juris or propriété publique to describe works that were not covered by copyright law. The phrase "fall in the public domain" can be traced to mid-19th century France to describe the end of copyright term. The French poet Alfred de Vigny equated the expiration of copyright with a work falling "into the sink hole of public domain" and if the public domain receives any attention from intellectual property lawyers it is still treated as little more than that which is left when intellectual property rights, such as copyright, patents, and trademarks, expire or are abandoned. In this historical context Paul Torremans describes copyright as a, "little coral reef of private right jutting up from the ocean of the public domain." Copyright law differs by country, and the American legal scholar Pamela Samuelson has described the public domain as being "different sizes at different times in different countries". Definitions of the boundaries of the public domain in relation to copyright, or intellectual property more generally, regard the public domain as a negative space; that is, it consists of works that are no longer in copyright term or were never protected by copyright law. According to James Boyle this definition underlines common usage of the term public domain and equates the public domain to public property and works in copyright to private property. However, the usage of the term public domain can be more granular, including for example uses of works in copyright permitted by copyright exceptions. Such a definition regards work in copyright as private property subject to fair-use rights and limitation on ownership. A conceptual definition comes from Lange, who focused on what the public domain should be: "it should be a place of sanctuary for individual creative expression, a sanctuary conferring affirmative protection against the forces of private appropriation that threatened such expression". Patterson and Lindberg described the public domain not as a "territory", but rather as a concept: "[T]here are certain materials – the air we breathe, sunlight, rain, space, life, creations, thoughts, feelings, ideas, words, numbers – not subject to private ownership. The materials that compose our cultural heritage must be free for all living to use no less than matter necessary for biological survival." The term public domain may also be interchangeably used with other imprecise or undefined terms such as the "public sphere" or "commons", including concepts such as the "commons of the mind", the "intellectual commons", and the "information commons". A public-domain book is a book with no copyright, a book that was created without a license, or a book where its copyrights expired or have been forfeited. In most countries the term of protection of copyright lasts until January first, 70 years after the death of the latest living author. The longest copyright term is in Mexico, which has life plus 100 years for all deaths since July 1928. A notable exception is the United States, where every book and tale published prior to 1924 is in the public domain; American copyrights last for 95 years for books written between 1924 and 1978. For example: the works of Jane Austen, Lewis Carroll, Machado de Assis, Olavo Bilac and Edgar Allan Poe are in the public domain worldwide as they all died over 100 years ago. Project Gutenberg makes tens of thousands of public domain books available online as ebooks. People have been creating music for millennia. The first musical notation system, the Music of Mesopotamia system, was created 4000 years ago. Guido of Arezzo introduced Latin musical notation in the 10th century. This laid the foundation for the preservation of global music in the public domain, a distinction formalized alongside copyright systems in the 17th Century. Musicians copyrighted their publications of musical notation as literary writings, but performing copyrighted pieces and creating derivative works were not restricted by early copyright laws. Copying was widespread, in compliance with the law, but expansions of those laws intended to benefit literary works and responding to commercial music recording technology's reproducibility have led to stricter rules. Relatively recently, a normative view that copying in music is not desirable and lazy has become popular among professional musicians. U.S. copyright laws distinguish between musical compositions and sound recordings, the former of which refers to melody, notation and/or lyrics created by a composer and/or lyricist, including sheet music, and the latter referring to a recording performed by an artist, including a CD, LP, or digital sound file. Musical compositions fall under the same general rules as other works, and anything published prior to 1922 is considered public domain. Sound recordings, on the other hand, are subject to different rules and are not eligible for public domain status until 2021–2067, depending on the date and location of publishing. The Musopen project records music in the public domain for the purposes of making the music available to the general public in a high-quality audio format. Online musical archives preserve collections of classical music recorded by Musopen and offer them for download/distribution as a public service. 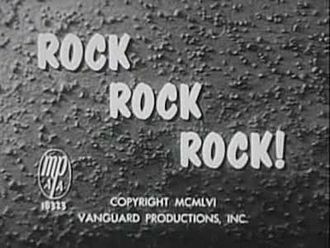 Rock, Rock, Rock, a film from 1956. A public-domain film is a film that was released to public domain by its author or because its copyright has expired. In 2016 there are more than 2,000 films on public domain in every genre, from musicals to romance, horror to animated movies and noir to western movies. Pamela Samuelson has identified eight "values" that can arise from information and works in the public domain. Access to cultural heritage through information resources such as ancient Greek texts and Mozart's symphonies. Derivative works include translations, musical arrangements, and dramatizations of a work, as well as other forms of transformation or adaptation. Copyrighted works may not be used for derivative works without permission from the copyright owner, while public domain works can be freely used for derivative works without permission. Artworks that are public domain may also be reproduced photographically or artistically or used as the basis of new, interpretive works. Works derived from public domain works can be copyrighted. Once works enter into the public domain, derivative works such as adaptations in book and film may increase noticeably, as happened with Frances Hodgson Burnett's novel The Secret Garden, which became public domain in the U.S. in 1987 and most of the rest of the world in 1995. By 1999, the plays of Shakespeare, all public domain, had been used in more than 420 feature-length films. In addition to straightforward adaptation, they have been used as the launching point for transformative retellings such as Tom Stoppard's Rosencrantz and Guildenstern Are Dead and Troma Entertainment's Romeo and Juliet. Marcel Duchamp's L.H.O.O.Q. is a derivative of Leonardo da Vinci's Mona Lisa, one of thousands of derivative works based on the public domain painting. Some works may never fully lapse into the public domain. A perpetual crown copyright is held for the Authorized King James Version of the Bible in the UK. While the copyright has expired for the Peter Pan works by J. M. Barrie (the play Peter Pan, or the Boy Who Wouldn't Grow Up and the novel Peter and Wendy) in the United Kingdom, it was granted a special exception under the Copyright, Designs, and Patents Act 1988 (Schedule 6) that requires royalties to be paid for commercial performances, publications and broadcasts of the story of Peter Pan within the UK, as long as Great Ormond Street Hospital (to whom Barrie gave the copyright) continues to exist. In a paying public domain regime, works that have entered the public domain after their copyright has expired, or traditional knowledge and traditional cultural expressions that have never been subject to copyright, are still subject to royalties payable to the state or to an authors' association. The user does not have to seek permission to copy, present or perform the work, but does have to pay the fee. Typically the royalties are directed to support of living artists. The Creative Commons proposed in 2010 the Public Domain Mark (PDM) as symbol to indicate that a work is free of known copyright restrictions and therefore in the public domain. The public domain mark is analogous to the copyright symbol, which acts as copyright notice. The Europeana databases use it, and for instance on the Wikimedia Commons in February 2016 2.9 million works (~10% of all works) are listed as PDM. The underlying idea that is expressed or manifested in the creation of a work generally cannot be the subject of copyright law (see idea–expression divide). Mathematical formulae will therefore generally form part of the public domain, to the extent that their expression in the form of software is not covered by copyright. Works created before the existence of copyright and patent laws also form part of the public domain. For example, the Bible and the inventions of Archimedes are in the public domain. However, translations or new formulations of these works may be copyrighted in themselves. Determination of whether a copyright has expired depends on an examination of the copyright in its source country. In the United States, determining whether a work has entered the public domain or is still under copyright can be quite complex, primarily because copyright terms have been extended multiple times and in different ways—shifting over the course of the 20th century from a fixed-term based on first publication, with a possible renewal term, to a term extending to 50, then 70, years after the death of the author. The claim that "pre-1924 works are in the public domain" is correct only for published works; unpublished works are under federal copyright for at least the life of the author plus 70 years. Works of the United States Government and various other governments are excluded from copyright law and may therefore be considered to be in the public domain in their respective countries. They may also be in the public domain in other countries as well. The legal scholar Melville Nimmer has written that "it is axiomatic that material in the public domain is not protected by copyright, even when incorporated into a copyrighted work". Before 1988 in the US, works could be easily given into the public domain by just releasing it without an explicit Copyright notice. With the Berne Convention Implementation Act of 1988 (and the earlier Copyright Act of 1976, which went into effect in 1978), all works were by default copyright protected and needed to be actively given into public domain by a waiver statement/anti-copyright can call notice. Not all legal systems have processes for reliably donating works to the public domain, e.g. civil law of continental Europe. This may even "effectively prohibit any attempt by copyright owners to surrender rights automatically conferred by law, particularly moral rights". An alternative is for copyright holders to issue a licence which irrevocably grants as many rights as possible to the general public. Real public domain makes licenses unnecessary, as no owner/author is required to grant permission ("Permission culture"). There are multiple licenses which aim to release works into the public domain. In 2000 the WTFPL was released as a public domain like software license. In 2009 the Creative commons released the CC0, which was created for compatibility with law domains which have no concept of dedicating into public domain. This is achieved by a public domain waiver statement and a fall-back all-permissive license, in case the waiver is not possible. The Unlicense, published around 2010, has a focus on an Anti-copyright message. The Unlicense offers a public domain waiver text with a fall-back public domain-like license inspired by permissive licenses but without attribution. In October 2014 the Open Knowledge Foundation recommends the Creative Commons CC0 license to dedicate content to the public domain, and the Open Data Commons Public Domain Dedication and License (PDDL) for data. In most countries, the term of rights for patents is 20 years, after which the invention becomes part of the public domain. In the United States, the contents of patents are considered valid and enforceable for 20 years from the date of filing within the United States or 20 years from the earliest date of filing if under 35 USC 120, 121, or 365(c). However, the text and any illustration within a patent, provided the illustrations are essentially line drawings and do not in any substantive way reflect the "personality" of the person drawing them, are not subject to copyright protection. This is separate from the patent rights just mentioned. Because trademarks are registered with governments, some countries or trademark registries may recognize a mark, while others may have determined that it is generic and not allowable as a trademark in that registry. For example, the drug "acetylsalicylic acid" (2-acetoxybenzoic acid) is better known as aspirin in the United States—a generic term. In Canada, however, "Aspirin", with an uppercase A, is still a trademark of the German company Bayer, while aspirin, with a lowercase "a", is not. Bayer lost the trademark in the United States, the UK and France after World War I, as part of the Treaty of Versailles. So many copycat products entered the marketplace during the war that it was deemed generic just three years later. Bayer also lost the trademark in the same jurisdictions for "Heroin" which it trademarked a year before it trademarked Aspirin. Public Domain Day is an observance of when copyrights expire and works enter into the public domain. This legal transition of copyright works into the public domain usually happens every year on 1 January based on the individual copyright laws of each country. The observance of a "Public Domain Day" was initially informal; the earliest known mention was in 2004 by Wallace McLean (a Canadian public domain activist), with support for the idea echoed by Lawrence Lessig. As of 1 January 2010[update] a Public Domain Day website lists the authors whose works are entering the public domain. There are activities in countries around the world by various organizations all under the banner Public Domain Day. ^ a b c Boyle, James (2008). The Public Domain: Enclosing the Commons of the Mind. CSPD. p. 38. ISBN 978-0-300-13740-8. Archived from the original on 14 February 2015. ^ Graber, Christoph B.; Nenova, Mira B. (2008). Intellectual Property and Traditional Cultural Expressions in a Digital Environment. Edward Elgar Publishing. p. 173. ISBN 978-1-84720-921-4. Archived from the original on 20 December 2014. ^ Copyright Protection Not Available for Names, Titles, or Short Phrases Archived 5 April 2016 at the Wayback Machine on copyright.gov "Listings of ingredients, as in recipes, labels, or formulas. When a recipe or formula is accompanied by an explanation or directions, the text directions may be copyrightable, but the recipe or formula itself remains uncopyrightable." ^ Lemley, Menell, Merges and Samuelson. Software and Internet Law, p. 34 "computer programs, to the extent that they embody an author's original creation, are proper subject matter of copyright." ^ skein_NIST_CD_121508.zip Archived 10 June 2016 at the Wayback Machine on skein-hash.info, skein.c "Implementation of the Skein hash function. Source code author: Doug Whiting, 2008. This algorithm and source code is released to the public domain." ^ contributor_copyright Archived 1 February 2016 at the Wayback Machine on cia.gov "The World Factbook is prepared by the Central Intelligence Agency for the use of US Government officials,[...] The Factbook is in the public domain"
^ a b c Ronan, Deazley (2006). Rethinking copyright: history, theory, language. Edward Elgar Publishing. p. 103. ISBN 978-1-84542-282-0. Archived from the original on 19 November 2011. ^ a b c d e Huang, H. (2009). "On public domain in copyright law". Frontiers of Law in China. 4 (2): 178–195. doi:10.1007/s11463-009-0011-6. ^ Torremans, Paul (2007). Copyright law: a handbook of contemporary research. Edward Elgar Publishing. pp. 134–135. ISBN 978-1-84542-487-9. ^ Torremans, Paul (2007). Copyright law: a handbook of contemporary research. Edward Elgar Publishing. p. 154. ISBN 978-1-84542-487-9. ^ Torremans, Paul (2007). Copyright law: a handbook of contemporary research. Edward Elgar Publishing. p. 137. ISBN 978-1-84542-487-9. ^ Ronan, Deazley (2006). Rethinking copyright: history, theory, language. Edward Elgar Publishing. p. 102. ISBN 978-1-84542-282-0. Archived from the original on 19 November 2011. ^ a b Ronan, Deazley (2006). Rethinking copyright: history, theory, language. Edward Elgar Publishing. p. 104. ISBN 978-1-84542-282-0. Archived from the original on 19 November 2011. ^ Ronan, Deazley (2006). Rethinking copyright: history, theory, language. Edward Elgar Publishing. p. 105. ISBN 978-1-84542-282-0. Archived from the original on 19 November 2011. ^ Boyle, James (1 January 2008). "The Public Domain: Enclosing the Commons of the Mind". Yale University Press. Retrieved 30 December 2016 – via Google Books. ^ Graber, Christoph Beat; Nenova, Mira Burri (1 January 2008). "Intellectual Property and Traditional Cultural Expressions in a Digital Environment". Edward Elgar Publishing. Retrieved 30 December 2016 – via Google Books. ^ "Copyright Registration of Musical Compositions and Sound Recordings" (pdf). United States Copyright Office. Retrieved 15 October 2018. ^ "Copyright Term and the Public Domain in the United States". Cornell University. Retrieved 15 October 2018. ^ a b Guibault, Lucy; Bernt Hugenholtz (2006). The future of the public domain: identifying the commons in information law. Kluwer Law International. ISBN 978-9-0411-24357. Archived from the original on 18 December 2014. ^ Perry&Margoni (2010). "From music tracks to Google maps: who owns Computer Generated Works?". Computer Law and Security Review. SSRN 1647584. ^ Stern, Prof Richard H. (2001). "L.H.O.O.Q. Internet related Derivative Works". Supplemental material Computer Law 484. The George Washington University Law School. Retrieved 23 May 2010. ^ Leaffer, Marshall A. (1995). Understanding copyright law. Legal text series; Contemporary Casebook Series (2nd ed.). M. Bender. p. 46. ISBN 0-256-16448-7. ^ a b Introduction to intellectual property: theory and practice. World Intellectual Property Organisation, Kluwer Law International. 1997. p. 313. ISBN 978-90-411-0938-5. Archived from the original on 6 April 2015. ^ Fishman, Stephen (September 2008). The copyright handbook: what every writer needs to know. Nolo. p. 178. ISBN 978-1-4133-0893-8. Retrieved 1 June 2010. ^ Fishman, Stephen (2008). Public domain: how to find and use copyright-free writings, music, art and more. Nolo. pp. 124–125. ISBN 978-1-4133-0858-7. ^ Public Domain Trouble Spots - Copyright Overview by Rich Stim - Stanford Copyright and Fair Use Center Archived 18 May 2016 at the Wayback Machine. Section called "Public Domain Works That Are Modified". ^ Lundin, Anne H. (2 August 2004). Constructing the canon of children's literature: beyond library walls and ivory towers. Routledge. p. 138. ISBN 978-0-8153-3841-3. Retrieved 1 June 2010. ^ Young, Mark (ed.). The Guinness Book of Records 1999, Bantam Books, 358; Voigts-Virchow, Eckartm (2004), Janespotting and Beyond: British Heritage Retrovisions Since the Mid-1990s, Gunter Narr Verlag, 92. ^ Homan, Sidney (2004). Directing Shakespeare: a scholar onstage. Ohio University Press. p. 101. ISBN 978-0-8214-1550-4. Retrieved 1 June 2010. ^ Kossak, Saskia (2005). "Frame my face to all occasions": Shakespeare's Richard III on screen. Braumüller. p. 17. ISBN 978-3-7003-1492-9. Retrieved 1 June 2010. ^ Cartmell, Deborah; Imelda Whelehan (2007). The Cambridge companion to literature on screen. Cambridge University Press. p. 69. ISBN 978-0-521-61486-3. Retrieved 1 June 2010. ^ Metzger, Bruce M. (2006). The Oxford companion to the Bible. Oxford: Oxford Univ. Press. p. 618. ISBN 978-0-1950-46458. ^ "Copyright, Designs and Patents Act 1988 (c. 48)". Office of Public Sector Information. 1988. p. 28. Archived from the original on 1 June 2008. Retrieved 2 September 2008. ^ "Creative Commons announces the Public Domain Mark". The H Open. The H. 12 October 2010. Archived from the original on 16 October 2010. Retrieved 12 October 2010. ^ Diane Peters (11 October 2010). "Improving Access to the Public Domain: the Public Domain Mark". Creative Commons. Archived from the original on 14 October 2010. Retrieved 12 October 2010. ^ Dennis Karjala, "Judicial Oversight of Copyright Legislation", 35 N. Ky. L. Rev. 253 (2008). ^ Nimmer, Melville B., and David Nimmer (1997). Nimmer on Copyright, section 13.03(F)(4). Albany: Matthew Bender. ^ "Copyright Term and the Public Domain in the United States". Archived from the original on 26 September 2010. Retrieved 30 December 2016. ^ Copyright Notice Archived 26 September 2012 at the Wayback Machine, U.S. Copyright Office Circular 3, 2008. ^ "About CC0 — "No Rights Reserved"". Creative Commons. Archived from the original on 28 April 2013. Retrieved 23 April 2013. ^ "11/17: Lulan Artisans Textile Competition". 17 June 2009. Archived from the original on 31 December 2016. Retrieved 30 December 2016. ^ "SPAM® Brand and the Internet". Hormel Foods. Archived from the original on 13 October 2009. ^ Kieren McCarthy (31 January 2005). "Hormel Spam trademark case canned". Archived from the original on 7 July 2008. Retrieved 2 September 2008. ^ a b Richmond, Shane (1 January 2010). "Happy Public Domain Day! Here's to many more – Telegraph Blogs". Blogs.telegraph.co.uk. Archived from the original on 15 May 2012. Retrieved 24 December 2011. ^ McLean, Wallace J. (1 January 2004). "Happy Public Domain Day!". American University. ^ Lessig, Lawrence (1 January 2004). "Public domain day - in Canada (Lessig Blog)". Lessig.org. Archived from the original on 7 November 2011. Retrieved 25 December 2011. ^ Public Domain Day 2010 Archived 14 October 2012 at the Wayback Machine at MetaFilter establishes the existence of the website at the time. Wikimedia Commons has media related to Public domain (copyright).